Aruba is a small island in the southern Caribbean Sea, lying less than twenty miles north of the coast of Venezuela on the mainland of South America. Initially colonized by the Spanish, Aruba came under Dutch control in 1636. In 1996 it became an autonomous nation but it remains a constituent part of the Netherlands. Tourism in Aruba dates back to the 1950s when large cruise liners first called at Oranjestad, the capital of Aruba. Since then, the tourist industry has grown steadily with most development taking place around the island’s sheltered western and southern coasts, which are noted for their beautiful sandy beaches and calm seas. Nowadays tourists travel from all over the world to enjoy Aruba’s tropical paradise. One of a number of modern, purpose-built Aruban beach resorts is Divi Aruba, which is pleasantly situated in the Boca Beach area on the island’s west coast. Divi Aruba has over 200 air-conditioned guest rooms, all with en-suite bathrooms/showers, telephone, TV, refrigerator, and private safe. 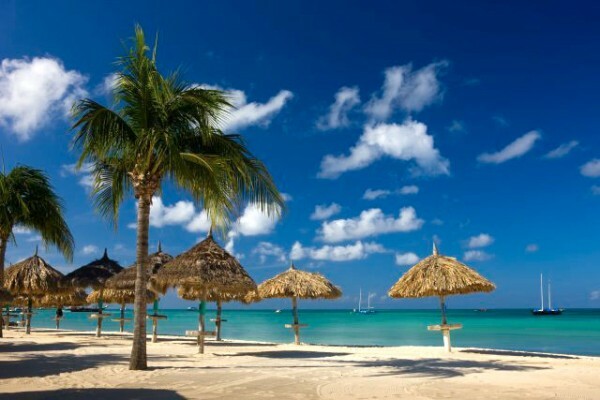 An all inclusive package deal at Divi Aruba entitles guests to unlimited meals and drinks at the resort’s various restaurants and bars, plus free access to tennis courts, swimming pools, and various water sports. A little to the north of Divi Aruba, on the southern outskirts of Oranjestad, is the Tamarijn Aruba resort. Located right on the beach front, Tamarijn Aruba is well-suited for family vacations, although the resort also offers honeymoon and golf package deals. Tamarijn’s accommodations are on a par with those at Divi, with all the resort’s 300-odd suites incorporating bathrooms/showers, A/C, TV, refrigerator, and an in-room safe for storage of guests’ valuables. The resort operates an all inclusive policy in which guests are free to enjoy unlimited drinks and food throughout the day and night at the resort’s seven bars and five restaurants. Also included is free-of-charge access to adult and child bicycles, tennis facilities, swimming pools and aquatic sports. Tamarijn Aruba also features a casino plus live entertainment every night, but it should be pointed out that an all inclusive package does not cover the cost of these attractions. The advantage of the kind of all inclusive family vacation deals on offer at Divi Aruba and Tamarijn Aruba is clearly that you know in advance what you are going to have to pay. It is all too easy to allow vacation spending to get out of control, through having to pay for this meal and that bar tab at different places. Before you know it, you could have exhausted your entire vacation budget, by failing to keep tabs on your spending. An “all-in” package avoids this, which is why many all inclusive resorts in Aruba represent such superb value for money.